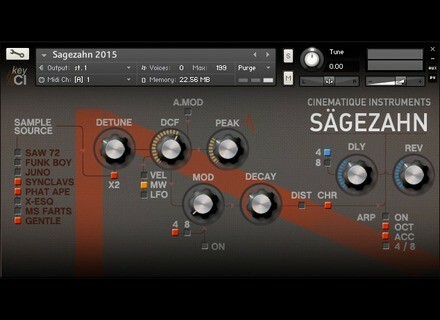 Sägezahn 2015, Virtual subtractive synth from Cinematique Instruments. 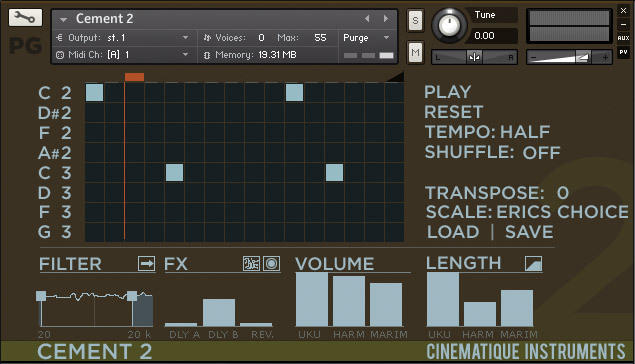 Cinematique Instruments now offers two of its virtual instruments for Kontakt for free, the Cement 2 and Sägezahn 2015. 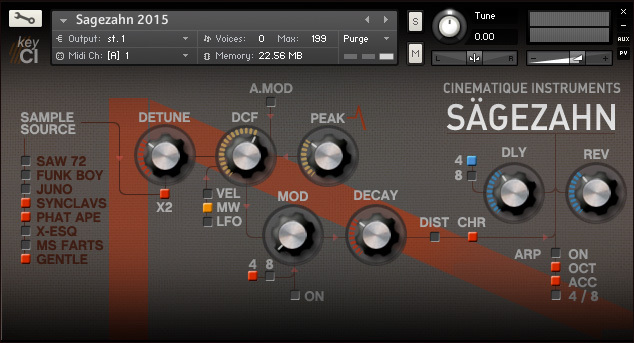 Sägezahn 2015 offers multiple sound shaping options, including modulation for filter and volume, resonance, frequency attack and decay controls, distortion and chorus effects, detune for the multi-voices and an arpeggiator is also included. Sägezahn is available for free download from www.cinematique-instruments.com/inst_sagezahn2.php. Cement 2 is a sequencer-based pattern generator with three instrument layers: a muted baritone ukulele with 2 round robins, electric guitar harmonics with 2 round robins and a marimba. The idea is to compile these sounds to generate new sonic colors and modify them with the included high and low-pass filter (with a random high-pass modulator), distortion, speaker emulation, sine wave for a sci-fi effect, two delays and a reverb. Cement 2 also includes 4 types of scales, transpose, shuffle, several tempo modes (sync to host or standalone) and you can store and recall full setting presets. Cement 2 can be downloaded from www.cinematique-instruments.com/inst_sagezahn2.php. 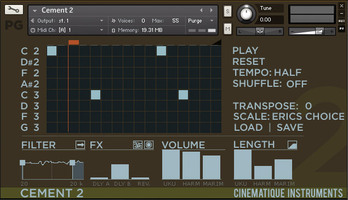 Note that both instruments require the full version of Kontakt 4/5. AudioThing samples a rare Moog synth Satellite is the name of this 70s Moog synthesizer that AudioThing sampled and worked in a library for Kontakt. Valentine sale at 8Dio 8Dio loves you and says it with a special offer on its Top 8 sample libraries until the end of the week. Gadjot, a notepad for your setup on iOS Tote Note offers on the AppStore a new app that allows musicians and engineers to store their setup settings.